Teresinka Pereira has just sent an e-mail informing us about the death of a poet from USA, Eddie Two Rivers, last 27th December, 2008, after a long battle with cancer. 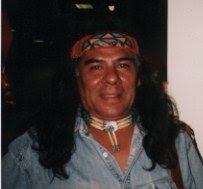 He was a talented poet, playwright and performer, and worked to obtain equal rights and justice for Native Americans. He was also dedicated to a number of causes such as AIDS, battered women, environmental issues, the death penalty, gang violence, hunger, homelessness and world peace. Eddie Two Rivers was born in 1945 in a small town in northwestern Ontario and father of many children. He was an Anishanobae from the Ojibwa tribe. As a profession he was a journeyman machinist, but then he started writing fulltime. Among his published poetry collections, A Dozen Cold Ones. He taught theatre at Truman College where he was Founding Artistic Director of Red Path Theater Company. He also worked in sales, construction, acting, and as a performance artist, a community organizer and union representative. His book Survivor's Medicine published by the University of Oklahoma Press in October 1998 won the 1999 AMERICAN BOOK AWARD given by the BEFORE COLUMBUS FOUNDATION. He addressed audiences at many of Chicago's most prestigious cultural and literary institutions and events. like they were supposed to care. Pow Wows, Fat Cats, and Other Indian Tales. Mammoth Publications and Woodley Memorial Press. Copyright 2003 the author. disrupting the nature of your spirit. my spirit has with yours. I must admit that having a blog has its many advantages. It is like a shopwindow looking towards an open world where people from all corners of the globe pass and look at it. Sometimes somebody dares to enter the shop and talk with the owner, that is, me. And the interesting thing is that the shopowner is all the time getting to know different people and learning new things. My last meeting was with a poet-painter from North Italy, Trieste, Toni Piccini. He wrote me an e-mail telling me that he saw my blog and Teresinka Pereira's poem about the children in Gaza. Toni Piccini politely asked me if I would be glad to publish some of his work on this blog. I saw his works and I think that they are beautiful: they are a mixture of colour, emotion, philosophy and motion. Dear Toni Piccini, a big THANKS for your artistic creations.